It was with plenty of tongue in cheek that the advertisement for the Bolton GP14 Open on Sunday 8 May referred to the event as the Barbados of the North, so most would still have been very surprised by the “Caribbean-esque” weather that the venue dished up, with warm sunshine and plenty of breeze being the order of the weekend. The event kicked off on the Saturday with a very well-received GP14 training day run by the experienced Tim Harper. Everyone who attended seemed to take away a great deal from the day and there was plenty of laughter heard both on and off the water. On Sunday it was down to the serious business, and most of those who had attended on the Saturday took advantage of the opportunity to put into practice what they had learned the previous day. 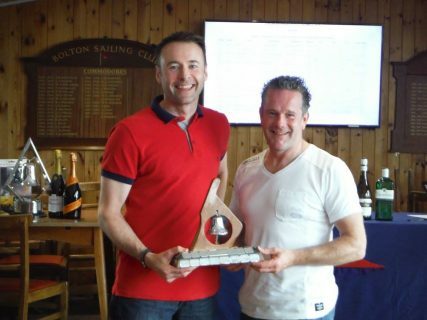 Principal Race Officer Andy Flitcroft and his team took full advantage of a brisk south-easterly breeze and set a course down the length of Belmont reservoir. 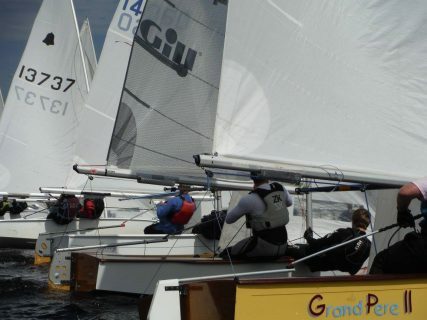 A 50/50 split of traveller and local boats made up the strong fleet of 16 GP14s that took to the water for race 1. Such was the enthusiasm to race in the warm sunshine and building force 4 breeze that it was only after 2 general recalls and the hoisting of the black flag that the first race finally got away. Matt Birks and Alan Jones set the early pace as they blasted from the line, took advantage of the early shifts, and rounded the first mark in front of the fleet. An interesting starting technique by David Bartholomew and Frank McMullen saw them on the course side, mid line, on port tack and stopped just as the gun went which provided an extra challenge to avoid for those starting near them and a great vantage point for David and Frank to watch the start unfold! The chase was on to catch Matt/Alan with a short fetch across the reservoir before a gybe and a long run down the lake. Gary Deighan sailing with Dale Knowles along with (the 420 youth squad?) pairing of Tom Wallwork and Sam Platt took advantage of some nice gusts rolling over the early leaders and starting the beat back in first and second places. It was a course that allowed those at the front to take full advantage of being able to decide where they needed to go and soon large gaps opened up with Gary/Dale continuing to lead until the finish and Tom/Sam comfortably in second. The talking point of the race was provided behind the leading two as Greg Thomas and Joel James, watched by the spectators ashore, missed out the inner of the finishing line, an error that was pointed out by Mike Senior as early as possible (honest!) and Mike sailing with Chris Waddington pipped them for 3rd. Race 2 set out with a similar pattern to race one with Mike/Chris, Tom/Sam, Greg/Joel and Gary/Dale all closely fighting for the early lead. Behind that group some of those recently returning from Barbados took the comparison with Caribbean a little too far and opted to sample what they hoped were the warm turquoise waters. The Courtney’s can now categorically confirm that when it comes to the water temperature, there in the comparison ends between Bolton and Barbados!! The course for race 2 was a simple triangle taking advantage of the full length of the reservoir and Mike/Chris were in front putting a tight cover on Gary/Dale behind, holding them there right up to the finishing line. Behind them a battle royal was raging in the silver fleet with placing changing all the time however the star performance of race 2 came from the Bronze fleet as Zena Martin crewed by Ian ‘Rat’ Thomson sailing a GP14 for her first ever full season crossed the finish line in a very creditable 7th in what were now increasingly difficult conditions. The GP14 Class President Duncan Greenhalgh and his crew Colin Quint demonstrated exactly why concentration is required in a GP14 right back to the shore and not just simply over the finishing line as their tack for home after receiving their finishing gun resulted in an untimely swim for them. Race 3 and it was all to play for with three pairings in with a chance of overall victory so, sure enough, those were the first boats to the windward mark with barely an inch separating them. Places changed often and the first lap saw all three of those in with a chance take a turn at the front before Mike and Chris finally dropped a little way back leaving the young pairing of Tom/Sam to fight it out with the not quite as young, Gary/Dale. Gary/Dale had the advantage during lap 2 and, having had a lesson in covering dished out to them by Mike/Chris in the previous race, they too opted for this tactic. Tom and Sam fought hard to break free but the lead pair hung on for their second race win and with it the overall victory. Tom/Sam’s second wasn’t quite enough to give them second overall as count-back gave that position to Mike and Chris and the boys had to settle for third. 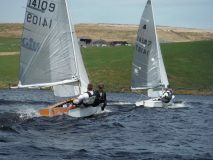 Behind them Chris Aubrey and his 12-year-old lad Joshua mastered the challenging conditions to edge out Richard Craig and Ella Ditchfield for the Silver fleet victory and a richly deserved special prize as the youngest competitor for Joshua. Zena and Rat’s stunning performance continued with a magnificent 9th overall and the Bronze fleet prize in what is Zena’s debut GP14 Open event. All that remained was for thanks to be given by Mike Senior on behalf of the travellers, and everyone left appearing to have had a great weekend in conditions being as close to Barbados as Bolton is ever likely to offer!